Structure 82Structure 9N-82 is known as the House of the Bacab because of the exquisite carvings found inside. But, the imagery starts on the outside, with the remnants of two busts set within false windows either side of the door (fig. W1129). These busts are of Pauahtun figures holding scribal instruments, which consisted of a half shell paint holder and a stylus. These busts gave the building its other familiar name, “The House of Scribes”. 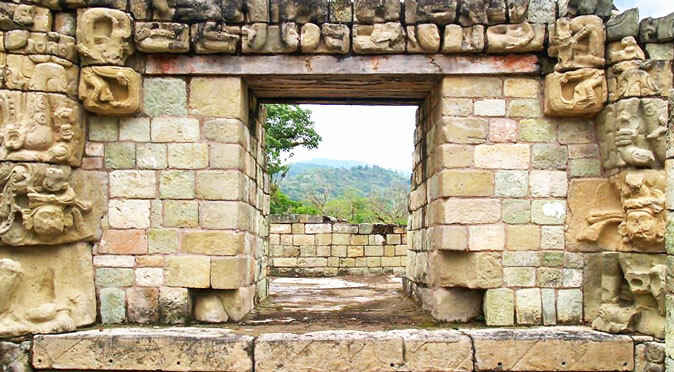 The windows are framed by serpent jaws, giving the image of Pauahun coming forth from within the sacred-serpent monster – an image that is repeated inside. From a distance, the carved window frames make the façade look like a representation of the mountain-monster, Cauac or Chaac (fig. W1129). W1095: Pauahtun When standing directly in front of the building, two pillars can be seen through the doorway which belong to an ornate bench and create the impression of two teeth in an otherwise toothless mouth (in fig. W1129 it looks like one tooth) – this produces the famous image of Pauahtun (fig. W1095). The entrances to Mayan temples were frequently designed to look like monster mouths because it was believed that caves were the mouths of the mountain monster-gods. The Temples were built on top of platforms that symbolised the sacred mountain and therefore the Temples became caves and openings to the Gods. Carving a monstrous mouth around the doorway enabled the priest or ruler to stand in the doorway and emulate the classic pose of being held in the jaws of the monster-god (as Pauahtun is seen doing in the windows and also on the bench inside – fig. W1126). 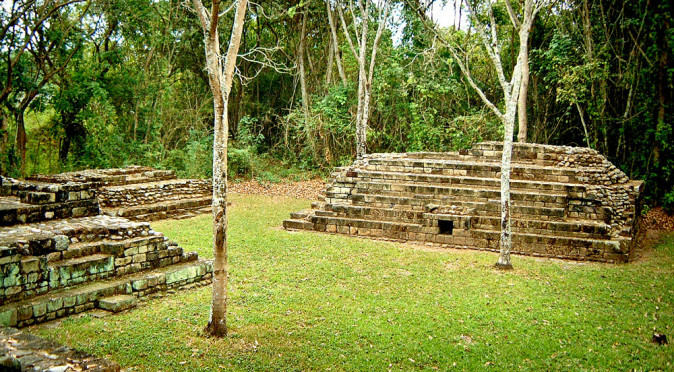 Structure 82 is raised on a platform and imitates a cave, therefore it is a Temple. Inside Structure 82 is a carved bench (which you can see through the doorway in fig. W1129 and also above in W1127). The bench is 6.5 metres long and 2.3 metres wide and is engraved along its entirety in a style known full-image. The text reads: | 11 Ahaw | 3 Chen | Dedication of this house | Mak-Chanal | Child of Lady-Sun-Flower | (top right of fig. W1127 starts here) And successor of | The house dedicator and constructor | the enterer | the deceased one | Ko-Xop-Ahaw | His first consecration (or dedication) | His keeper of Sacred Books | Yax Pasaj | Chan Yat | Sacred Lord of Copán | 20 year Warrior1. 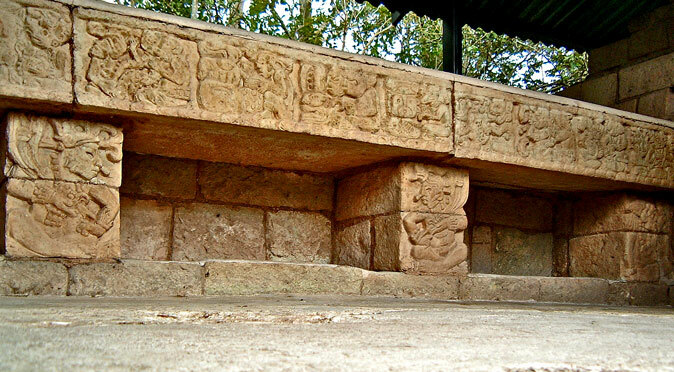 In summary, the bench seems to be saying that the building was built and is now being consecrated on the 10th July 781AD by Mak-Chanal, who is the son of Lady-Sun-Flower and the successor to the deceased lord, Ko-Xop, as the Keeper of the Sacred Texts for the Sacred Lord of Copan, Yax Pasaj Chan Yopaat. W1128: Atlantean Ba’kab Supporting the bench are 6 “atlantean” pillars that are intricately carved with characters known as the Bacab (Ba’kab). The Ba’kab are aspects of Pauahtun in his role of supporting the four-corners of the universe. 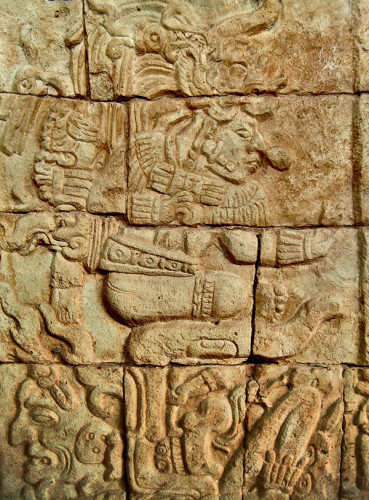 Four Bacab supported the earth-realm on their backs to prevent it from slipping back into the underworld (they are also seen on the Cosmic Doorway of Temple 22 at Copan where they support the Sky-Band thought to symbolise the cosmos). They are named as Cantzinal, Hosanek, Hobnil, Saccimi. and represent the four directions (north, south, east, west), four colours (white, yellow, red and black) and four years (Muluk, Cauac, Kan and Ix). On the bench in Structure 9N-82, they present small figurines in their palms which look like God-K. The protrusion from their noses may be an indication of breath to demonstrate they are alive. They support the bench to prevent its occupant from sinking into the underworld. W1126: Scene from Bench EndThe bench is terminated with an angled back rest at either end for supporting pillows (presumably). This end section is also intricately carved (fig. W1126) with a character who sits upon the curled upper jaw of a serpent, whose mouth gapes open to spew forth an aged Pauahtun head (clearly visible in the bottom left corner of fig. W1126). Just above the ear of the Pauatun’s head, you can see the serpent’s curling fang and beneath his chin and jaw you can see two more fangs jutting up (the actual lower jaw of the serpent is just out of shot). Leading back past Pauahtun’s ear, you can then see the serpent’s eye and then Pauahtun’s arm can be seen jutting upwards as though he is lying on his chest and trying to push himself up. This emblematic of the earth or sky being raised up during creation, with the grimacing Pauahtun heaving the sky-serpent up out of the underworld and into the sky. 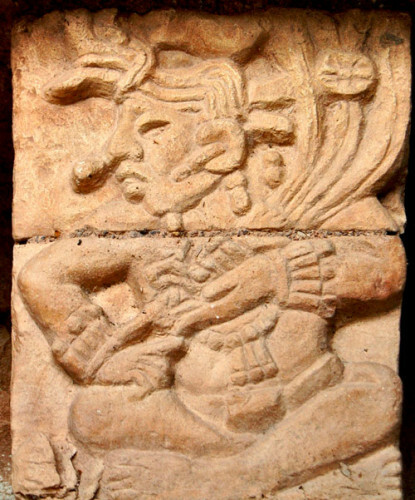 The character on top is overseeing the event and carries a turbaned God-K on his back as they rise – perhaps symbolic of the birth of the Copan kingship or divine lineage. The character also has breath emanating from his nose to emphasise that he is alive, suggesting this is either his birth – or his rebirth. 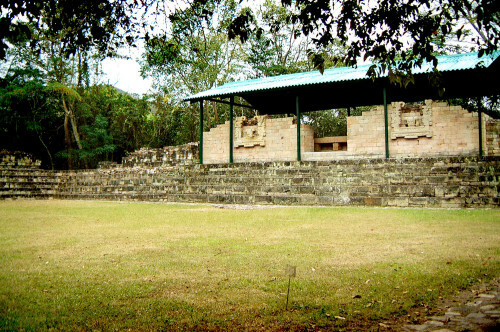 As mentioned in the text, the Holy Lord of Copan at this time was Yax Pasaaj Chan Yopaat. His name is composed of two glyphs on the bench, Yax Pasaj and Chan Yat, which translate to “first-dawn” and “sky-piecer”. Dawn is also equivalent to the creation of the earth, so his name translates to “creator of the earth and sky”. The image on the end of the bench (fig. W1126) pays homage to this event, depicting Yax Pac summoning the ba’kab to raise the sky-serpent, whilst carrying God-K on his back – thus creating the earth, the sky and the royal lineage (symbolised by God-K). The bench is housed in the central building of three, with the two adjoining buildings set-back on either side. These also contained benches, but they were not inscribed. 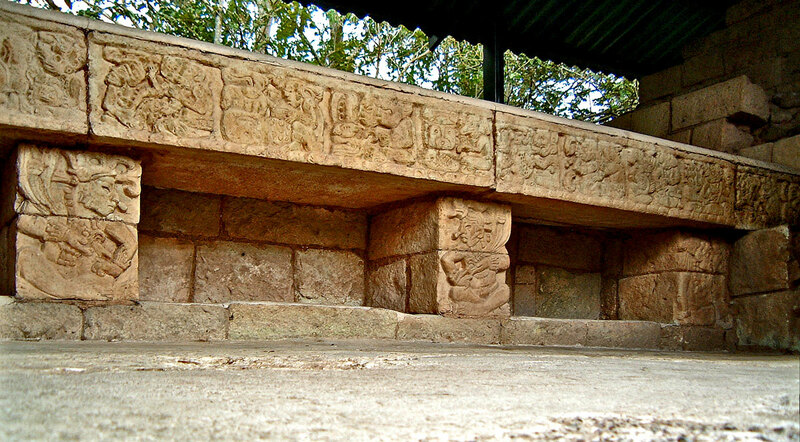 The bench is quite clearly of the same principle and quality as the one commission by Yax Pasaaj some years later in Structure 10L-18 (click here to view). 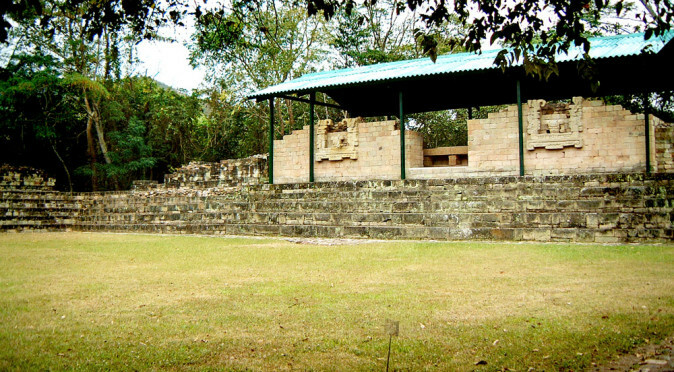 Structure 82 sits on the south side of Plaza A which was a particularly special place within Las Sepulturas. 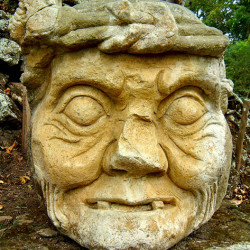 One of the oldest burials found at Las Sepulturas is that of a powerful shaman or High Priest, who was buried within Plaza A in the mid-fifth century – shortly after Copan had been founded. There are very few burials in Plaza A, unlike the other areas of Las Sepulturas, and the buildings are also comparatively larger and there is no kitchen area. This supports the idea that the building is a Temple and the Plaza is a sacred sanctuary. 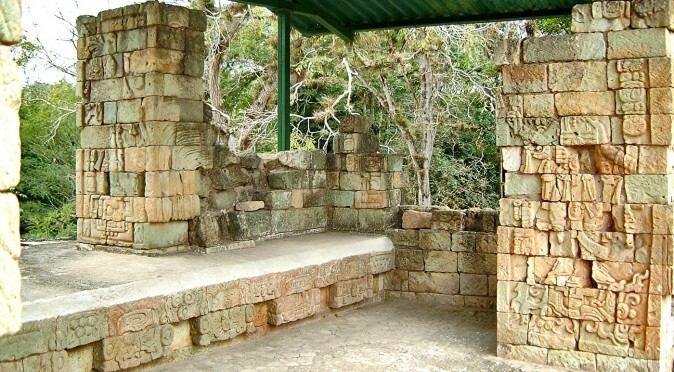 Many suggest that the bench and the building are evidence of a split from Copán, with the people of Las Sepulturas building their own religious centre. However, the text on the bench clearly states that the occupier of the building was subservient to Yax Pasaj and held his “Sacred Books”. And far from turning against the king, the scene at the end of the bench glorifies the king as the creator of the universe. It would seem more probable that Las Sepulturas was the seat of the High Priest. Harking back to the founding of Copan as a Mayan City, it is possible that the local chief, who could have also been a divine lord, may have been given the seat of Las Sepulturas and given the illustrious title of Keeper of the Sacred Books to make way for K’inich Yax K’uk’ Mo’, yet still keep his own divine lineage going. If this were so, then holy Keeper of the Sacred Books would require a Temple structure for him to dwell in, which is what Structure 82 appears to be.